If you have any experience working with Switchvox you already know that it has a handy page for updating to new Switchvox versions. For those not familiar, log in as an administrator and go to Machine Admin > Updates in pre-5.x versions or Server > Maintenance > Updates for versions 5.0 and later. An important tip that I wanted to make everyone aware of today is that for those updating their servers from any release before 5.0 with the intention of getting to the latest release, you want to make sure and update Switchvox in at least a couple of steps rather than straight to the latest release. For example, if updating a server which is currently on 4.6.4 or release 30500 (as seen above) you would want to update first to the earliest version of 5.0 on the list (release 34816). Then from there update to 5.5 (version 44416). Once that is complete you are clear to update to the latest release (5.7.3 or 55758 as of this post). If you are on any version prior to 4.6.4 you would want to first update to 4.6.4 before moving to 5.0. It is not necessary to update to every version in between those I pointed out however please note that Switchvox will allow you to skip all prior versions and go straight to the latest but that IS NOT recommended by Digium Switchvox support. 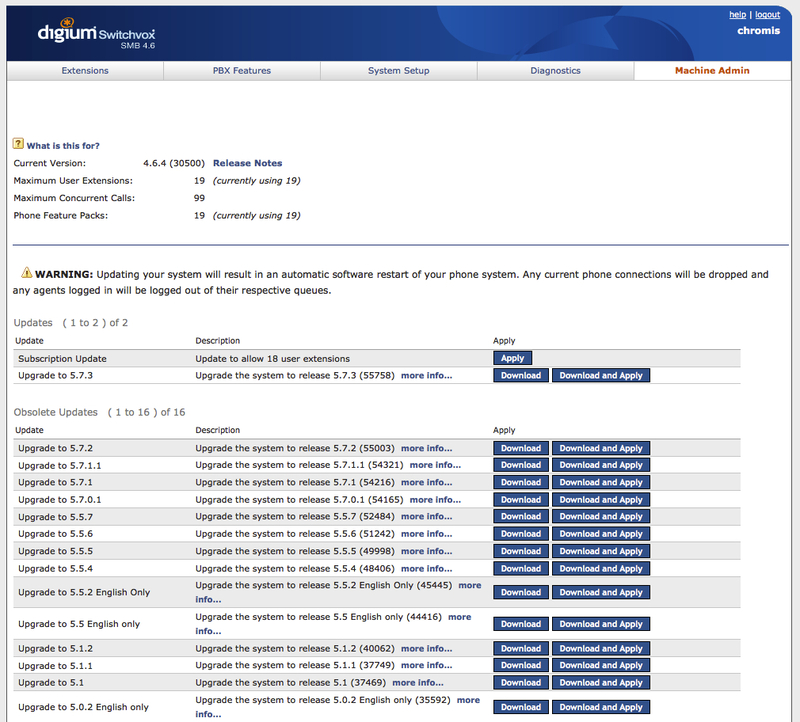 You can view the release notes for all versions of Switchvox by visiting: http://www.digium.com/en/products/switchvox/support/switchvox-release-notes.